This floral tie bow blouse, floral tab sleeve blouse, draped tweed blazer, and mixed media sweater all caught my eye! This cognac jacket, red plaid top, distressed jeans, pendant necklace, and this blue bangle bracelet are all perfect for fall! This leather pocket dress in either color, yellow tulip hem dress, this cardigan in olive, and these red suede d'orsay flats with tassels are all fabulous! This crepe dress in black floral, plaid skirt, suede boots in burgundy, and definitely this bag! The Icon or the City trench coat need to be mine! This pleated mini skirt, caged flats, and the Margot top are definitely on my list, too! What is on your Labor Day wishlist? See how else I've worn this dress with chambray, neon, statement necklace, and a utility vest. So pretty! I'm so jealous of your great weather, it's been rainy and hot all weekend here in Florida. No chance of opening the windows for months! Enjoy the fall, it's such a great time of the year! It really is a great season but goes much too quickly! Love this gorgeous scarf with your maxi! What a beautiful way to dress it up. Happy Labor Day! So pretty! I love that you took a plain maxi and added so much style to it with your accessories! I really need to get a black maxi dress, they can be dressed up and down and just worn any season! Love how you styled it with the scarf... we were having cooler temps, but now it is in the 90's again! Boo! I need to check out that Express and ON sale!!! Thanks for sharing this sales. You can never go wrong with a simple maxi dress. That black dress certainly can take you places ! Nicely worn. It's funny because I don't normally think of Labor Day as a clothing sale time---so thanks for the reminder!! 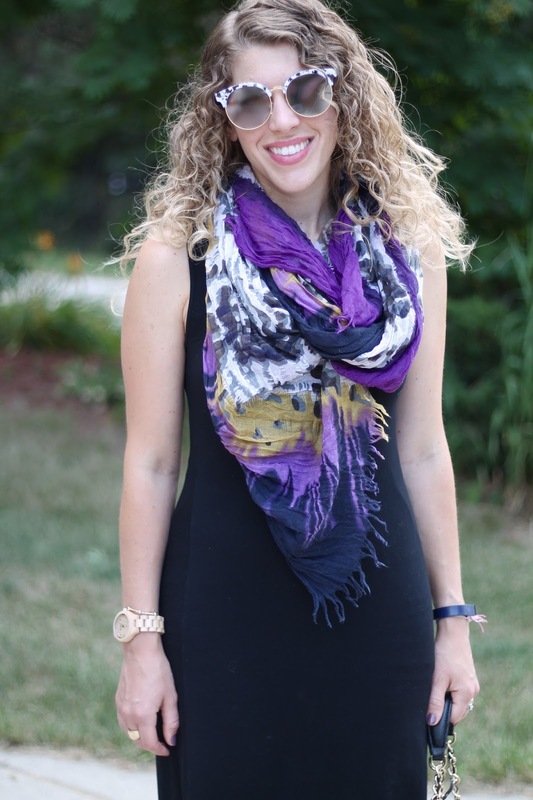 I do love this scarf with the maxi---what a great way to add some color! Love the shades! What a fun look! This is such a pretty look! 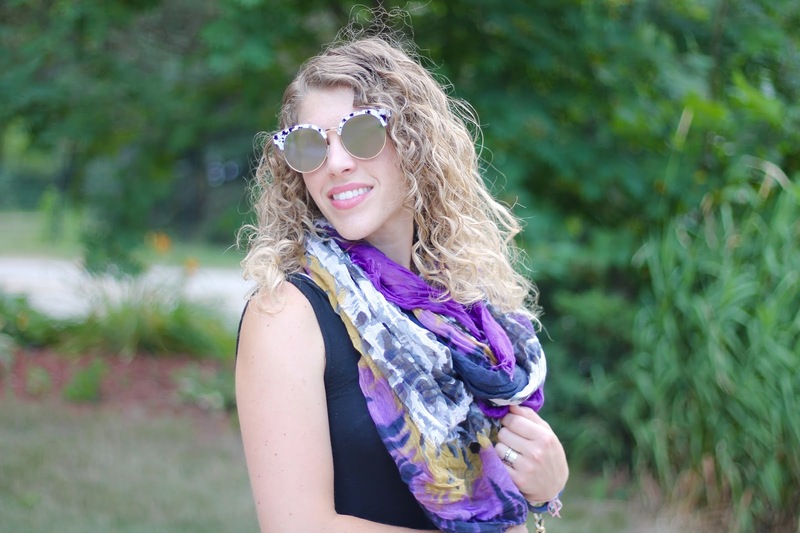 I love your scarf and fun sunnies! Great look! Love your scarf, so colorful! dang--wish I had seen this! Your dress is gorgeous and nice for summer. I love this look--that scarf really pops against that black maxi dress! I didn't do too much Labor Day shopping, although I was tempted! I did get some shoes for me and my husband on a buy 1 get 1 50% off sale at Off Broadway though!